We arrived at Paris Charles de Gaulle Airport early ready to board our flight back home. After we proceeded through customs and x-rays, I saw that there were many boutiques and souvenir shops. 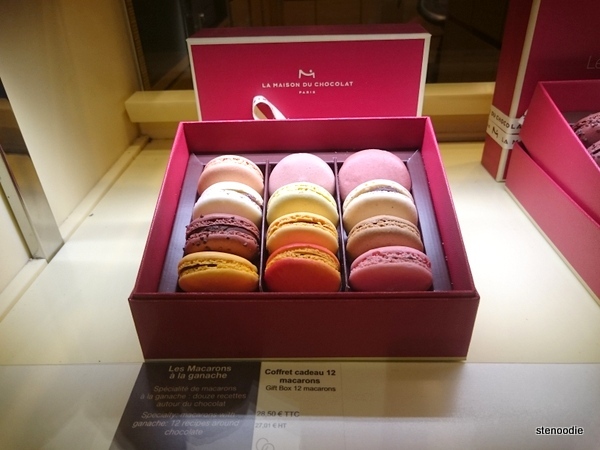 Typical of Paris, France, there was also a Ladurée shop! 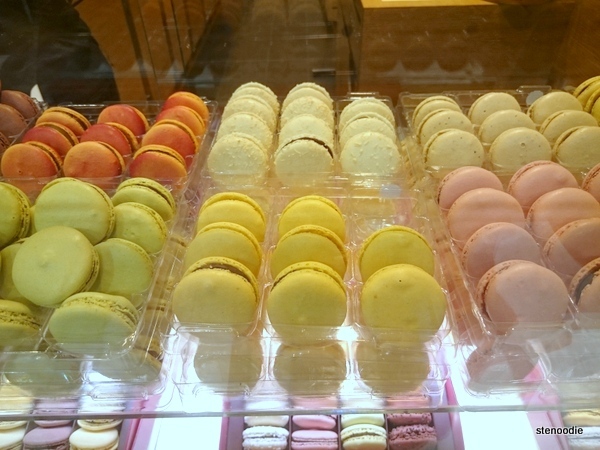 Even though I had tried my first French macarons from there already, I still wandered into the shop to peek around. 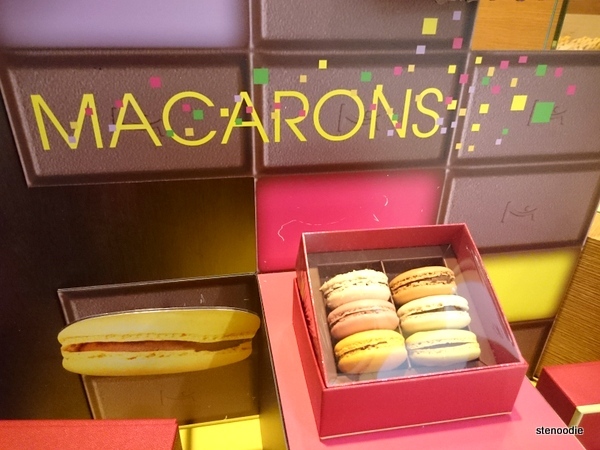 🙂 Across from it though, there was a La Maison du Chocolat that also had displays of chocolate and macarons! 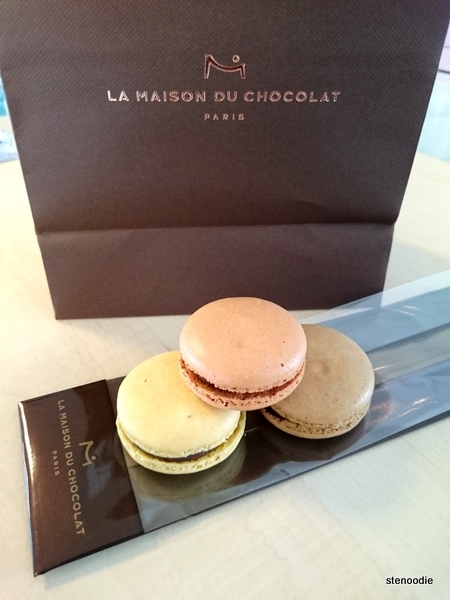 While I was browsing the macarons, the man behind the counter gave us some chocolates to sample. I believe I had a dark chocolate to try. Mmm, yum! Macarons with a chocolate ganache heart galore! 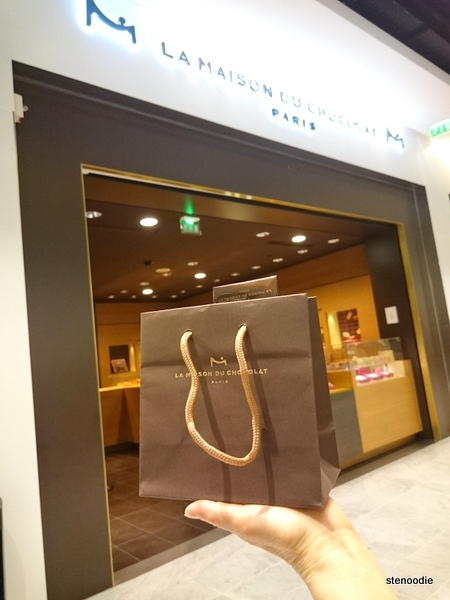 I decided to get three macarons to try from here (to compare with that of Ladurée and also because I felt like I wanted one more true French macaron before I left France). 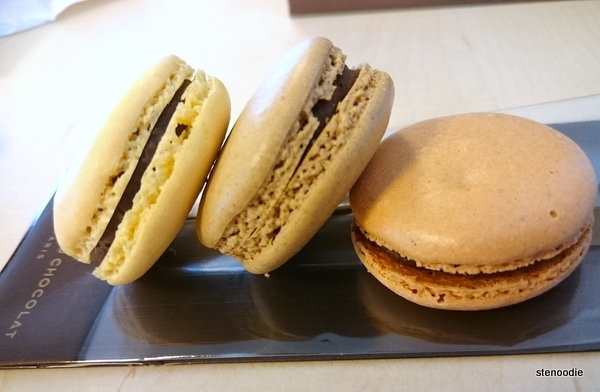 There were a number of flavours, all with a heart of chocolate ganache in the centre between the two crisp macaron shells. 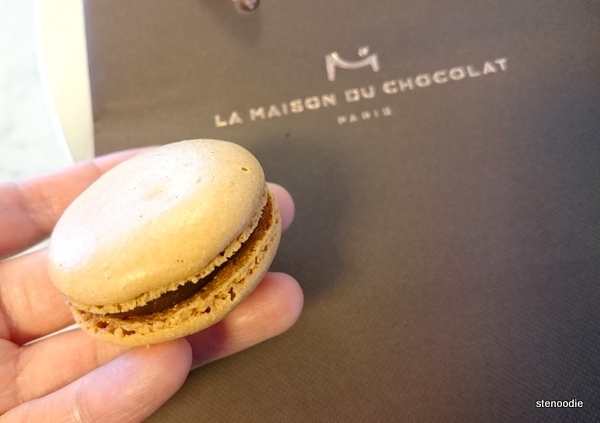 Now I know why these macarons were distinctly from “La Maison du Chocolat”! I chose the Caramel, Lemon, and Coffee flavours. 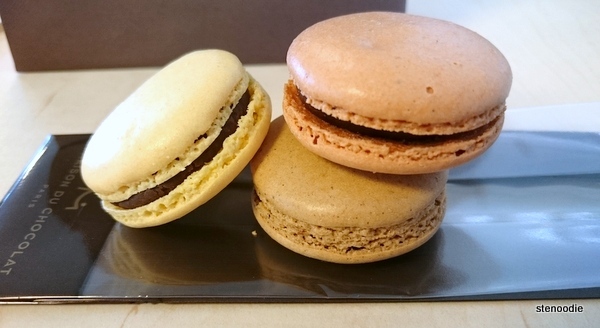 I found that the chocolate ganache heart really sweetened things up and took away from the flavour of the macaron. 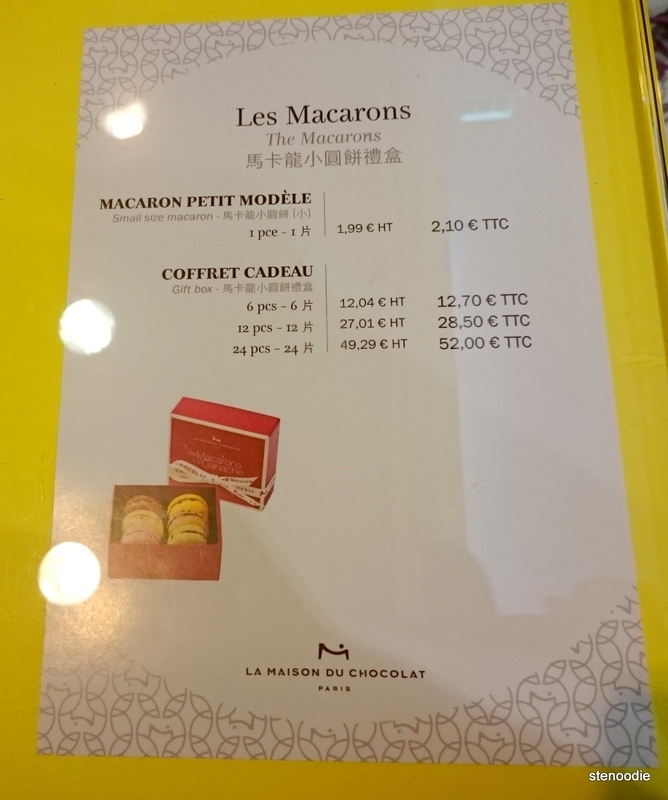 I also found that the shell of the macarons weren’t as crunchy or crisp as the ones from Ladurée. 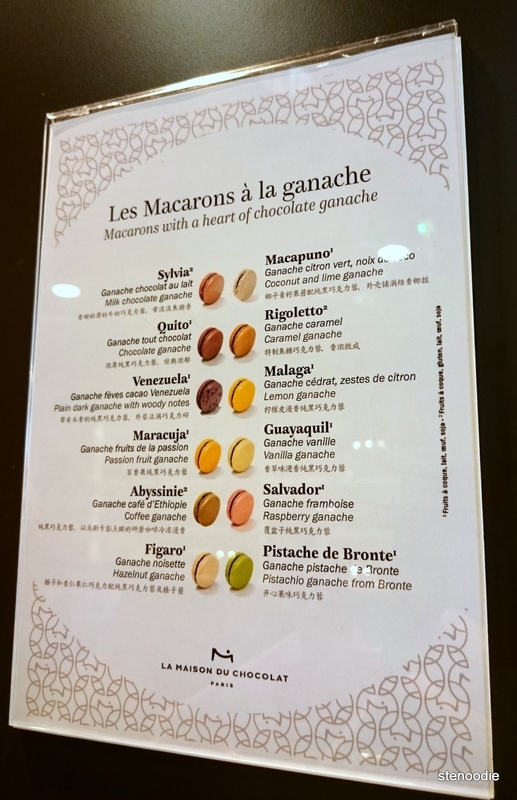 I still did taste the flavours of the lemon, coffee, and caramel, but I definitely think I could have done without the chocolate ganache centres. This entry was posted in Food, Travel and tagged 5 rue du Cercle, @MaisonChocolat twitter, Aéroport Roissy Charles de Gaulle Terminal 2F1, food blogger, foodie, La Maison du Chocolat, La Maison du Chocolat macaron prices, La Maison du Chocolat macarons, macarons from France, macarons inside Charles de Gaulle airport, Paris France, reviews, Zone sous douane 95700 Roissy-en-France. Bookmark the permalink.